Three houses designed by Hoppin & Koen in Aiken, South Carolina. The first is 'Sandhurst', the W.H. Sands estate built c. 1900. Click HERE to see 'Sandhurst' on bing. 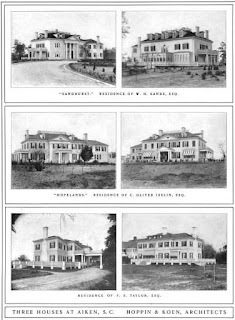 The second is 'Hopelands', the Charles Oliver Iselin estate built c. 1900. The house was demolished in 1970 but the grounds are open to the public as Hopeland Gardens. The third is the F.S. Taylor estate built c. 1901. It is unconfirmed if the Taylor house is extant. Image from Architectural Review, 1902. Sandhurst seemingly has been on the market for ages although possibly finally purchased. Please do post more about Aiken in the coming days! for what its worth, though I don't think it's the case here, Koen did supervise some jobs for White. Your post has stirred up quite a discussion among a group of 'Old Aiken'-ites about the three houses attributed to Hoppin & Keon. Most know 'Sandhurst', which is on the market again and was recently the site of a sale to dispose of all furnishings left by the most recent owner/resident. They also know about 'Hopelands', which was demolished some years ago. The property is now a beloved city park. But the F.S.Taylor residence was unknown to them. I dig some research and found the F.S.Taylor winter cottage 'Deodara' in Aiken has been hiding in plain sight. The house had several owners before it was bought by the George brothersin 1947. George Funeral Home is still in operation today.